Students aren’t just blending colors on the canvas at The King Art Studio; they’re blending art and education. 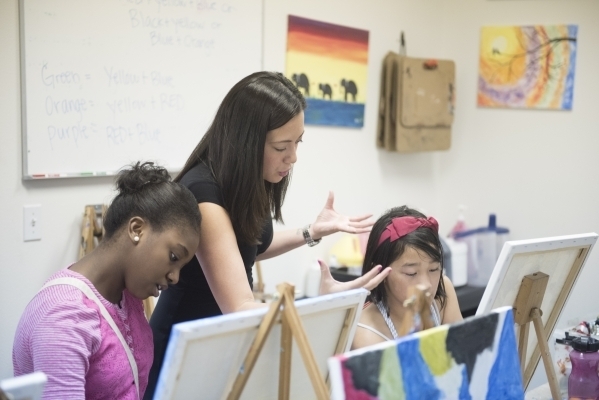 The studio, which opened six months ago at 2016 W. Sunset Road, Suite 100, offers instruction primarily for children, incorporating a curriculum tailored to each student’s interests and abilities. 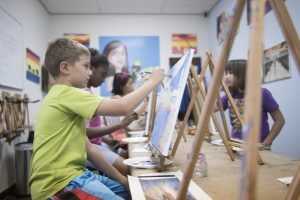 “If the student’s strength is not in drawing, they usually will be slowly progressed into painting later on after they learn drawing skills,” said Sarah King, who owns and operates the business. 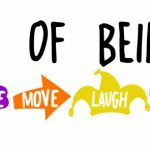 Classes include mandatory weekly homework and are available in painting, drawing, graphic design, sculpture, and arts and crafts, led by instructors with degrees in either art or education. King, who has a master’s in education and a bachelor’s in fine art, taught art for about seven years in the Clark County School District and at private and charter schools, she said. The business began at King’s home, where student enrollment began growing dramatically, making it a challenge to accommodate classes at the casida on her property. She said opening her new commercial space allowed her to accommodate more students and address growing demand. About 100 children are now involved in the studio’s programs, said King’s husband, Alex King, who takes care of the information technology portion of the business. “Everybody has their day and time of the week, so they come on a weekly basis,” he said. Classes are geared toward preparing students to pursue art in high school and college, eventually making it a career, Sarah King said. She said many of her students have been accepted at Las Vegas Academy, for instance. 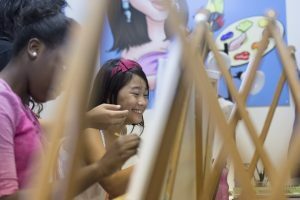 The studio seems to be a perfect fit for Alexandra Musa, 9, who was taking a painting class Aug. 14 and plans to own a gallery one day. Currently, she’s practicing making thin lines and painting what she sees in nature. “I like to draw animals and a lot of flowers,” she said. Her mother, Chris, said Alexandra regularly works on arts and crafts projects at home, such as making greeting cards. 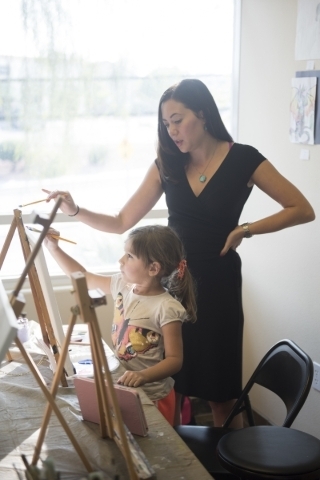 Aside from classes, the business offers open art studio time, Mommy and Me art classes, portfolio development, Boy and Girl Scout workshops, artist workshops and summer art camps, among other programs. Sarah King also owns a side business, Best Painting Parties, which hosts gatherings where participants can sip wine, paint and socialize at her studio, at one of its partnering venues, or at clients’ homes or offices. Group lessons are $25, and a private lesson is $45. For more information on classes and rates, visit thekingartstudio.com, call 702-522-1900 or email info@www.thekingartstudio.com. For more information on Best Painting Parties, visit bestpaintingparties.com.